Guided by Design System Principles, the System Design team will meet with you, the customer, in order to conceptualize a layout that best maximizes your food ingredient and seed processing systems. Once the virtual components have been established, the System Design team will collaborate with Production Engineering to develop the most efficient methods to manufacture parts and machines utilizing the latest 2D and 3D software. Your success is our success. It’s a mantra that is very much a part of the System Design team and what initially may seem impossible becomes achievable once we develop a realistic strategy to achieve your goals. Throughout the course of your project, practically all of LMC’s best talents will be utilized to make it happen. Typically, when working on turnkey projects, they are essentially designed from the ground up and entail every aspect of our engineering capabilities. Please see this prime example of a 30 ton per hour shelling plant, Premium Peanut in Douglas, Georgia being constructed in this video. And for customers looking to upgrade or modify their existing facilities, we utilize a state-of-the-art laser scanner which creates point clouds to record their as-built state. This tool has greater accuracy and reduces amount of time needed to document the customer’s existing design when compared with having to use traditional tape measure methods. As the customer, your feedback is just as critical not only to your project but to us as well. Your relationship with everyone at LMC is vital to make us a better company. It’s a System Design formula which has worked for over 75 years and something we will continue to improve upon as we look forward to the future. 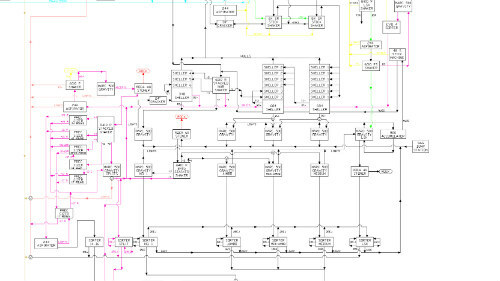 The initial phase of any project is to use a flowchart to discuss what machines and components would be used. This also helps with planning for the production of parts and assemblies. The System Design team uses a variety of standard components to help reduce project costs but can customize transfer spouting where applicable.